:What if the Supernatural Became Normal and Natural in Your Life? How would your world change if you regularly experienced the miraculous? And what if this happened everywhere you went-in a way that attracted people to Jesus? It wouldn't just make a difference in your world...it would make the world different. It might sound too good to be true...but that's the Spirit Contemporary life. While working as a first responder in an ambulance, Leon Fontaine longed to see God's power at work outside the four walls of the church. He learned through many life-changing experiences that we can all unlock the miraculous in a way that works anywhere-at home, in a hospital, at work-with anyone! The Spirit Contemporary way of life involves communicating with others as Jesus would...using their language, stories, and settings. Leon draws on biblical truth and personal stories to reveal how this dynamic first-century faith can be yours when you live so in tune with God that you're guided in ways that are both natural and supernatural. The Spirit Contemporary Life reveals the key to living an empowered life-one that connects your day-to-day existence with God's supernatural power. When faced with the realities of a hurting world as a first responder-EMT, Leon Fontaine developed a passion for seeing God's miraculous power at work--not only at the altar--but also in the back of his ambulance. And he wanted to do it in a way that wasn't strange or off-putting to those who didn't know Christ. 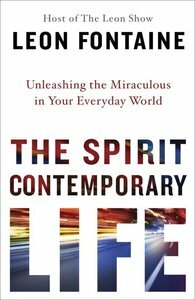 About "The Spirit Contemporary Life: Unleashing the Miraculous in Your Everyday World"